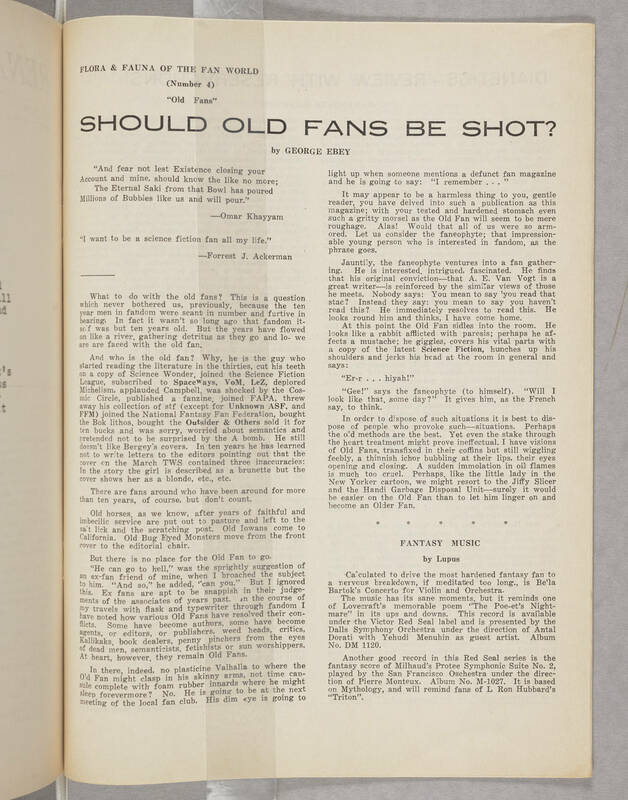 Flora & Fauna of the Fan World (Number 4) "Old Fans" SHOULD OLD FANS BE SHOT? By George Ebey "And fear not lest Existence closing your Account and mine, should know the like no more; The Eternal Saki from that Bowl has poured Millions of Bubbles like us and will pour." —Omar Khayyam "I want to be a science fiction fan all my life." —Forrest J. Ackerman ___________ What to do with the old fans? This is a question which never bothered us, previously, because the ten year men in fandom were scant in number and furtive in bearing. In fact it wasn't so long ago that fandom itself was but ten years old. But the years have flowed on like a river, gathering detritus as they go and lo- we are are faced with the old fan. And who is the old fan? Why, he is the guy who started reading the literature in the thirties, cut his teeth on a copy of Science Wonder, joined the Science Fiction League, subscribed to SpaceWays, VoM, LeZ, deplored Michelism, applauded Campbell, was shocked by the Cosmic Circle, published a fanzine, joined FAPA, threw away his collection of stf (except for Unknown ASF, and FFM) joined the National Fantasy Fan Federation, bought the Bok lithos, bought the Outsider & Others sold it for ten bucks and was sorry, worried about semantics and pretended not to be surprised by the A bomb. He still doesn't like Bergey's covers. In ten years he has learned not to write letters to the editors pointing out that the cover on the March TWS contained three inaccuracies: in the story the girl is described as a brunette but the cover shows her as a blonde, etc., etc. There are fans around who have been around for more than ten years, of course, but don't count. Old horses, as we know, after years of faithful and imbecilic service are put out to pasture and left to the salt lick and the scratching post. Old Iowans come to California. Old Bug Eyed Monsters move from the front cover to the editorial chair. But there is no place for the Old Fan to go. "He can go to hell," was the sprightly suggestion of an ex-fan friend of mine, when I broached the subject to him. "And so," he added, "can you." But I ignored this. Ex fans are apt to be snappish in their judgements of the associates of years past. In the course of my travels with flask and typewriter through fandom I have noted how various Old Fans have resolved their conflicts. Some have become authors, some have become agents, or editors, or publishers, weed heads, critics, Kallikaks, book dealers, penny pinchers from the eyes of dead men, semanticists, fetishists or sun worshippers. At heart, however, they remain Old Fans. In there, indeed, no plasticine Valhalla to where the Old Fan might clasp in his skinny arms, not time capsule complete with foam rubber innards where he might sleep forevermore? No. He is going to be at the next meeting of the local fan club. His dim eye is going to light up when someone mentions a defunct fan magazine and he is going to say: "I remember . . ." It may appear to be a harmless thing to you, gentle reader, you have delved into such a publication as this magazine; with your tested and hardened stomach even such a gritty morsel as the Old Fan will seem to be mere roughage. Alas! Would that all of us were so armored. Let us consider the faneophyte; that impressionable young person who is interested in fandom, as the phrase goes. Jauntily, the faneophyte ventures into a fan gathering. He is interested, intrigued, fascinated. He finds that his original conviction—that A. E. Van Vogt is a great writer—is reinforced by the similar views of those he meets. Nobody says: You mean to say 'you read that stac? Instead they say: you mean to say you haven't read this? He immediately resolves to read this. He looks round him and thinks, I have come home. At this point the Old Fan sidles into the room. He looks like a rabbit afflicted with paresis; perhaps he affects a mustache; he giggles, covers his vital parts with a copy of the latest Science Fiction, hunches up his shoulders and jerks his head at the room in general and says: "Er-r . . . hiyah!" "Gee!" says the faneophyte (to himself). "Will I look like that, some day?" It gives him, as the French say, to think. In order to dispose of such situations it is best to dispose of people who provoke such—situations. Perhaps the old methods are the best. Yet even the stake through the heart treatment might prove ineffectual. I have visions of Old Fans, transfixed in their coffins but still wiggling feebly, a thinnish ichor bubbling at their lips, their eyes opening and closing. A sudden immolation in oil flames is much too cruel. Perhaps, like the little lady in the New Yorker cartoon, we might resort to the Jiffy Slicer and the Handi Garbage Disposal Unit—surely it would be easier on the Old Fan than to let him linger on and become an Older Fan. * * * * * FANTASY MUSIC by Lupus Calculated to drive the most hardened fantasy fan to a nervous breakdown, if meditated too long, is Be'la Bartok's Concerto for Violin and Orchestra. The music has its sane moments, but it reminds one of Lovecraft's memorable poem "The Poe-et's Nightmare" in its ups and downs. This record is available under the Victor Red Seal label and is presented by the Dalls Symphony Orchestra under the direction of Antal Dorati with Yehudi Menuhin as guest artist. Album No. DM 1120. Another good record in this Red Seal series is the fantasy score of Milhaud's Protee Symphonic Suite No. 2, played by the San Francisco Oschestra under the direction of Pierre Monteux. Album No. M-1027. It is based on Mythology, and will remind fans of L. Ron Hubbard's "Triton".